In 2014, three Michigan health systems, Beaumont, Oakwood, and Botsford, joined together under the Beaumont name to form the largest health system in the state with the goal of providing greater access to care for patients. In support of this goal, Beaumont needed to create a consistent, integrated brand and build network awareness for all of its providers. 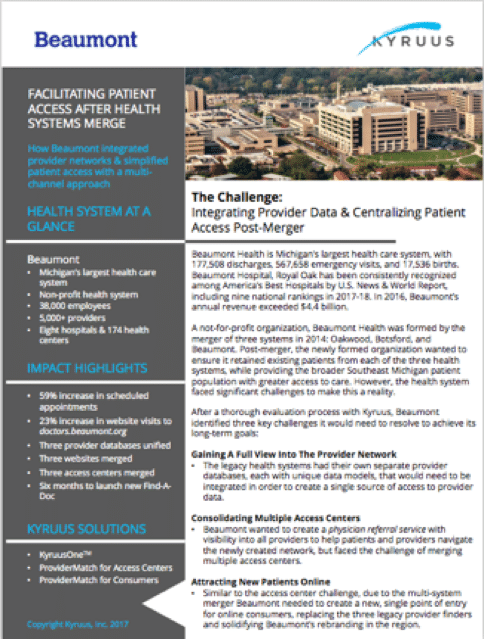 Beaumont also faced the challenges of consolidating its various entry points—access centers and websites—to simplify the patient journey and enhance access.